Known as the Pearl of the Arabian Gulf, the Kingdom of Bahrain has been consistently staying up to its nickname and reputation during the last decade, despite the political and economic turbulences the Gulf Cooperation Council (GCC) region has been enduring. As a matter of fact, the Kingdom of Bahrain was ranked as the best place to live and work in by Expat Insider 2017 survey due to the ease of settling in and career satisfaction. A lot of factors have contributed to Bahrain’s internationally renowned status as both the center of major trade routes and a famous tourist attraction. Such factors include the fact that it was the first country in the region to have a post-oil economy as its main industry has been financial services and not the petroleum sector, as well as the recognition of its rich cultural heritage and history. With that in mind, One & Only Seef resort certainly comes as one of the biggest upcoming tourism projects in Bahrain. What differentiates One & Only Bahrain resort from its competitors? One & Only Seef resort is situated on the Northwestern coast of the Kingdom of Bahrain in Seef town, which is known for housing lucrative real estate investment opportunities. It will be the first project of the leading international resort brand in the Kingdom of Bahrain, is planned to feature extra-luxurious amenities that will help it stand out among the furious competition it will be facing from the other resort brands in the region. These amenities include its private lagoon which spans area equivalent to that of three soccer fields combined, the Kingdom of Bahrain’s first branch of Hakkasan, the upscale modern UK-based Chinese restaurant as well as a Givenchy Spa. 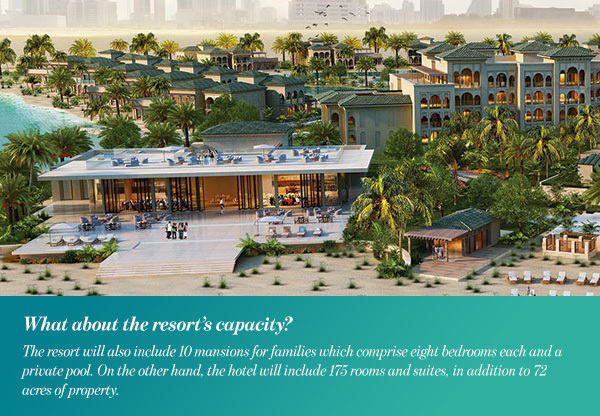 What about the resort’s capacity? The resort will also include 10 mansions for families which comprise eight bedrooms each and a private pool. On the other hand, the hotel will include 175 rooms and suites, in addition to 72 acres of property. How will One & Only Seef contribute to the kingdom’s image? According to Jimmy Colson, the General Manager of One & Only Seef resort, the resort will help in positioning the kingdom internationally as a travel destination. The number of visitors to the Kingdom of Bahrain has been growing slightly yet steadily through the years, recording a 6% growth in 2017. The ultra-luxurious resorts’ brand has been known for choosing a few numbers of countries to which their target clients are willing to travel to expand in. By providing the visitors with the right extra-luxurious facilities and amenities they would be looking for, the resort will help in prolonging the length of their stay in the kingdom. Although One & Only Bahrain resort’s completion date was originally estimated to be sometime within the year 2016, it has been delayed a couple of time and the latest opening date is predicted to be in the current year. 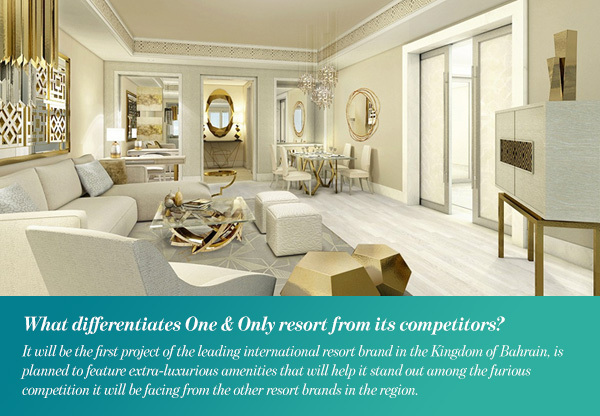 Why is One & Only Seef expected to be a pivotal addition to the kingdom’s hospitality industry? Launched in 2003 by the Dubai-based resorts’ developer Kerzner International, One & Only resorts’ brand has been consistently renowned for being a high-end luxury brand that is favoured by celebrities and globetrotters from all around the world. So far, the One & Only brand has built 9 resorts in some of the most beautiful and exotic attractions around the world like South Africa, Australia, Mexico, UAE, Maldives, Mauritius, and Montenegro. The brand is expected to add two new locations this year to its rich portfolio, which are One & Only Sanya in Hainan, China, and One & Only Seef in Bahrain. The One & Only resorts’ brand has been internationally awarded and recognized multiple times. Last year, the brand was ranked as the 6th out of the best 15 hotel brands around the world. Generally speaking, all the 9 branches of One & Only resorts have been consistently ranked among the top 100 hotels and resorts in the world in TripAdvisor Traveler Choice Awards. On the other hand, individually speaking, most of the branches of the brand have been either awarded or recognized as some of the best ultra-luxurious attractions in their cities. For example, One & Only Cape Town was ranked as the 5th Best City Hotel in Africa by Travel + Leisure World’s Best Awards in 2017. Also, One & Only The Palm in Dubai has been ranked as the best beach by Andrew Harper Grand Awards 2018. For all of the aforementioned reasons and more, the opening of the first branch of the world-class brand in the Kingdom of Bahrain is highly anticipated and is expected to fulfill an existing market need for extra luxurious amenities and accommodations. By doing this, the resort will contribute to the Kingdom of Bahrain’s economic development and renowned status as one of the most beautiful havens in the GCC area and help it in not only attracting more visitors, but also in keeping them for a longer time.